Reindeer hooves may not be the only tip-tapping you hear this winter. 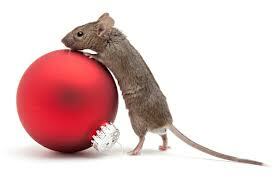 As the days get shorter, colder and darker, your house becomes a cozy place for animals, mainly rodents, to come in and make themselves at home. The last thing anyone wants is to hear the telltale scurrying of mice or rats above them. Besides being terrible house guests, in some cases, rodents can bring in diseases like Salmonella and Hantavirus. It’s hard enough staying healthy during flu season without the worry of food contamination too. In addition, they can be hosts to a multitude of other pests, such as lice, fleas, ticks and mites. And with the extra miles of cord and wire most people have in and around their homes for the Holidays, the risk of house fires goes up significantly. Cover any outside vents or chimney with screens. And if that doesn’t work…. Call Us! If you have normal bi-monthly or quarterly pest services with us, installing and maintaining rodent boxes is included!